The 4Q18 GDP report shows stable 6.4% YoY growth and 6.6% for full-year 2018. But the details suggest that the economy is not as solid as the GDP growth figure. Fixed asset investment grew 8.7% YoY in December. 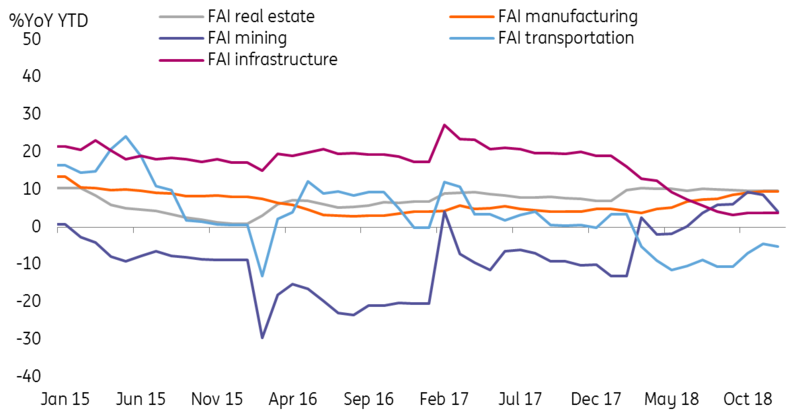 But this was thanks to infrastructure investment, which rose 3.8% YoY (from 3.7% YoY), and brought growth in metal products of 15.4% YoY (used in the production of metro lines, projects being led by local governments). Industrial production grew faster at 5.7% YoY in December from 5.4% YoY. However, again, when we look at the details, we find that CAPEX-related items are shrinking, not growing. For example, industrial robot production shrank 12.7% YoY. Retail sales tell a story of a cautious consumer, one that is not keen to spend on luxury items. For example, automobile sales fell 8.5% YoY in December. Even though there are some signs of hope stemming from the negotiations on US-China trade, we believe that both sides will only agree on certain standard trade issues. The more important topics in the trade talk, intellectual property and the transfer of technology, are much more difficult to reach agreement on. And China's Vice-Premier Liu He will not be able to decide on these topics alone. That's why we believe that by 1 March 2019, the trade talks may only have agreements on trade but not technology. In this case, there will be a growing number of developed economies, or even emerging economies, trying to ban the use of China-made electronic components and goods. That will hurt the production sector of electronics in China, and the prices of these items will fall in China. Producers of these electronic parts and goods will face an increased chance of closing down, and debt default. To avoid this, the Chinese government has to allow these companies to issue bonds in the capital market or tap banks to repay their outstanding loans to survive. Debt levels will therefore increase. ... there will be a growing number of developed economies, or even emerging economies, trying to ban the use of China-made electronic components and goods. That will hurt the production sector of electronics in China, and the prices of these items will fall in China. 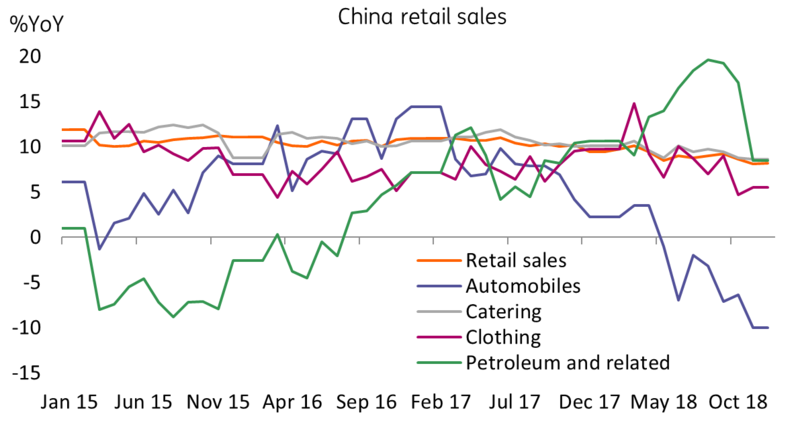 Our baseline forecast assumes that the trade war will continue in 2019. GDP will be 6.3% as fiscal stimulus of CNY 4 trillion and 3 more RRR (required reserve ratio) cuts will support the economy in terms of funding and liquidity. We expect USD/CNY reaching 7.30 by end of 2019. But all these forecasts depend on the progress of trade talk. If China and the US can reach an agreement not only on trade items but also on technology items, policies in China will change. China will not need fiscal stimulus of that size, and there could be fewer RRR cuts. Most importantly, USD/CNY need not depreciate from 2018, and could even appreciate to 6.50 as the trade environment improves. But for the time being, as we don't see a high chance of meaningful improvements from the trade talk, especially on the technology topics, we are keeping our baseline forecasts.